If you’re one of the folks that enjoys in doing things themselves, then there’s no doubt that you might want to give a try to these baby mobiles. 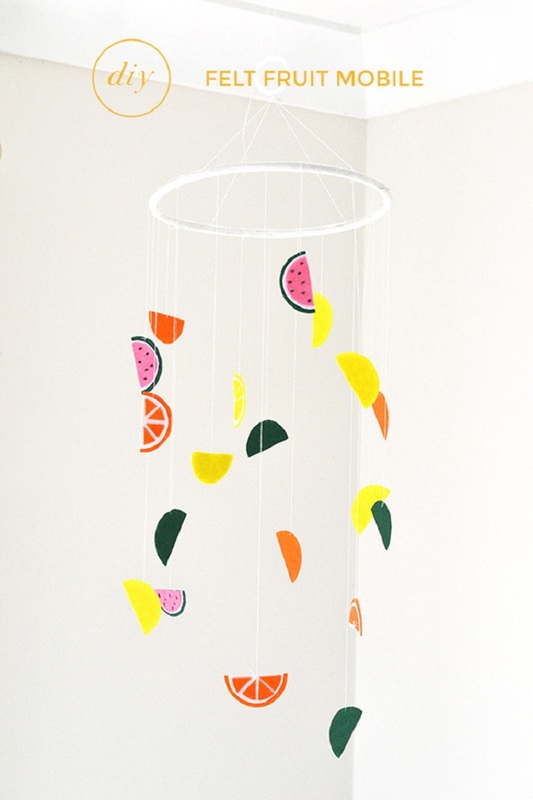 Ahead you will find ten DIY nursery mobiles that every parents would want for their newborn. These are really simple to make no matter how basic your skills are and what is really important is that they are budget – friendly, yet with your effort they will even look as store-bought. Just scroll along and find the one you think it’s the cutest for a newborn! 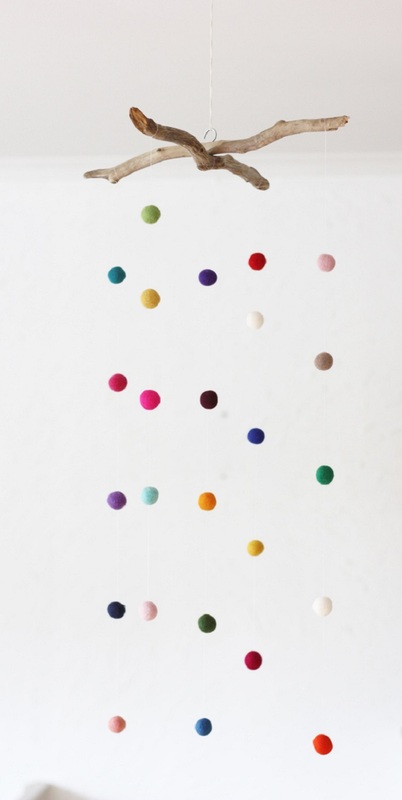 These colorful felt balls can be the perfect way to add some color in your kid’s room, especially if the walls are white. 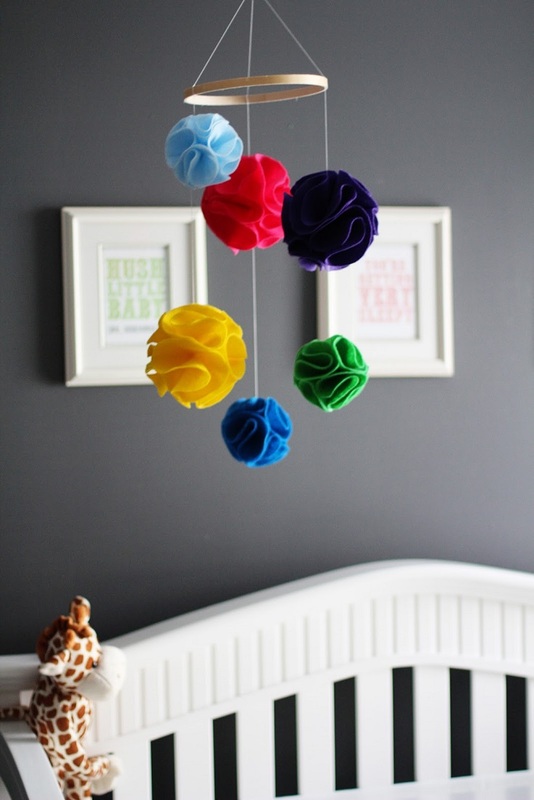 It will create a nice contrast and the felt balls will be the focal point of the room. 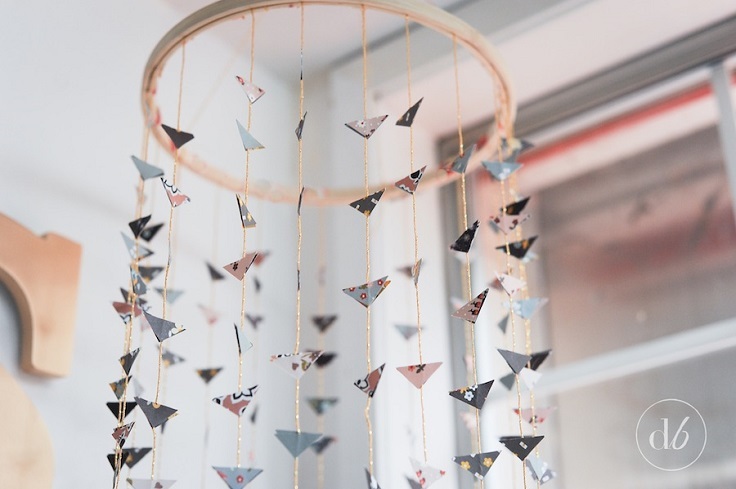 To make this mobile yourself, you need 2 sticks of driftwood which should be approximately 25 cm/9.8 in long, 25 felt balls, white tread, a needle and a hook screw long enough to go through both the sticks. Time for some origami! They are simple, interesting and cute craft that you can make together with your children – isn’t this a great idea for some family time? 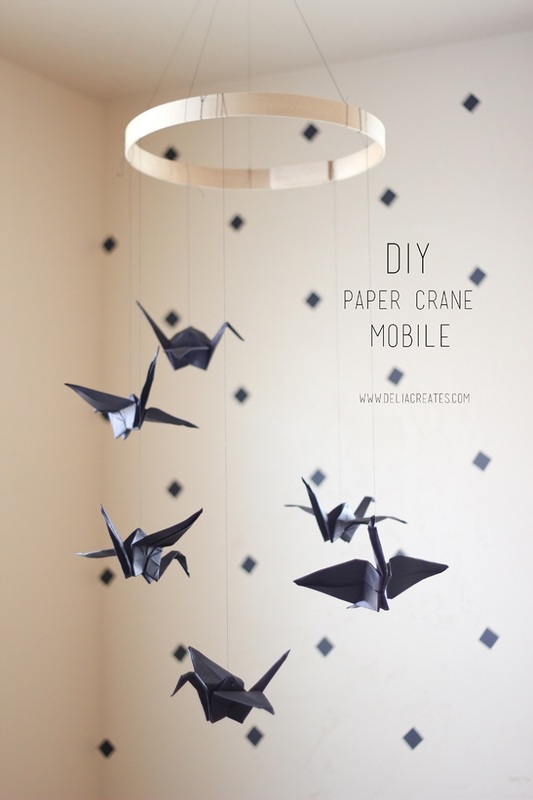 Besides all this, the paper crane mobile is very budget – friendly, as all you need is card stock paper to create the paper cranes, black thread and a needle and most likely you already have these at home! You might experience difficulties with creating the planes if you’re new at this, but after few times we’re sure you’ll get it! Here we have this cuteness overload of a baby mobile! 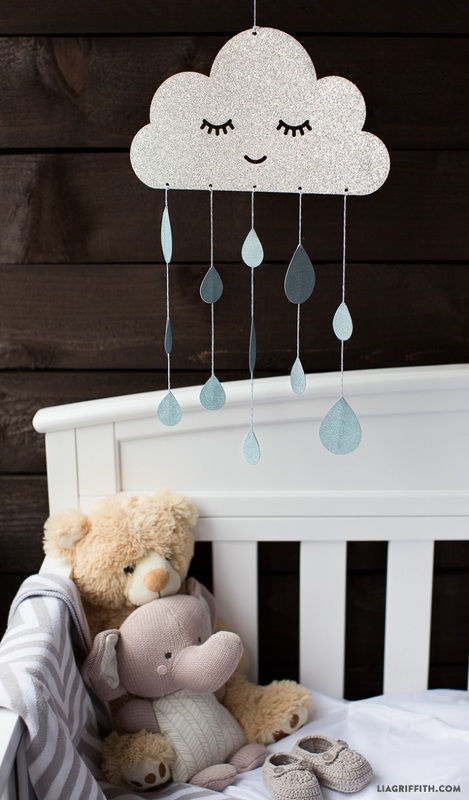 That cloud and those raindrops surely will make your kid’s room more charming and will add such a warming atmosphere into it. For the cloud, you can find a template download on the website below the picture in PDF version or SVG in case you use cutting machine, or make your own with silver glitter card stock. You’ll also need x-acto knife, hole-punch, blue glittery card stock for the raindrops, matching baker’s twine and hot glue gun. 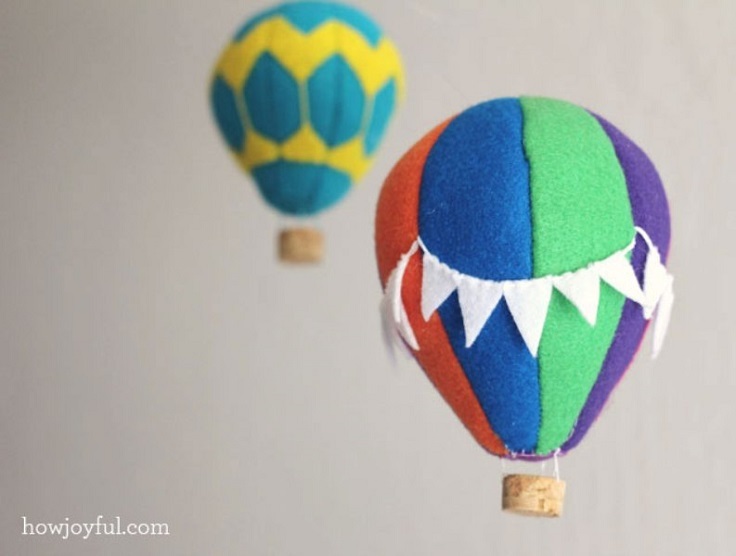 Hot air balloons seem like a very nice detail to a nursery mobile, don’t you agree? We absolutely fell in love with idea, so sharing with you was a must. You need multicolor felt, embroidery needle and embroidery floss, scissors, invisible thread, embroidery hoop, polyester fiberfill,or any stuffing you’d like and Cork pieces for the basket. You can also download for free a PDF of the hot air balloon in three sizes. 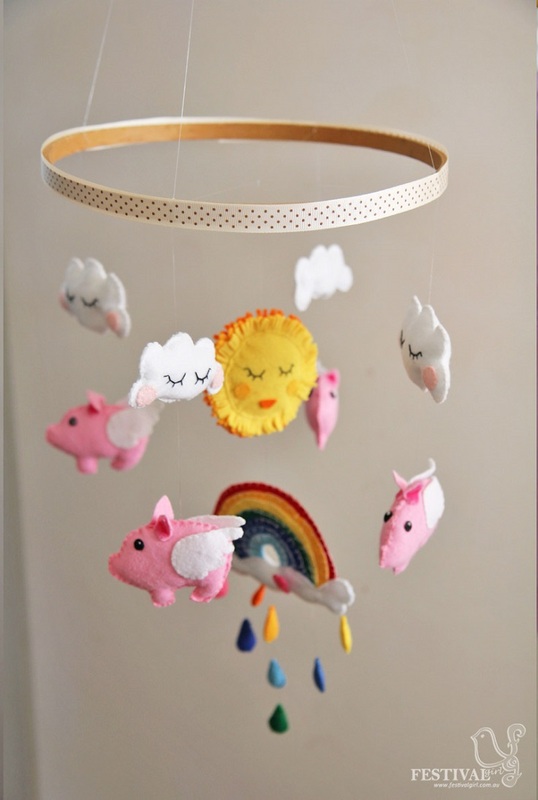 Now, flying pigs is definitely not something you, but with a little creativity they can be such a cute details for your kid’s mobile. The main star for this craft is the felt and make sure to pick the stiffer kind, other materials that you need are fabric scissors, paper scissors, small embroidery scissors with a sharp point, at least 3 medium size needs, string with all the colours of the rainbow, some really fine fishing line (the thinner the better), an embroidery hoop, a packet of wadding, paper designs for your cut outs, some super glue or fabric glue and a couple of tooth picks. Here’s another way that you can play with felt and its shape. Creating them that way might take some time, but once you get to know the trick you’ll really have some fun! It’s budget – friendly and all the materials you need besides the felt are heavy cotton thread, cross stitch hoop, ceiling hook, glue. You can experiment with colors too, for example you can make them all in one color so that they can better fit the room’s interior, or you can make it colorful! Next thing we have are the geometrical shapes. 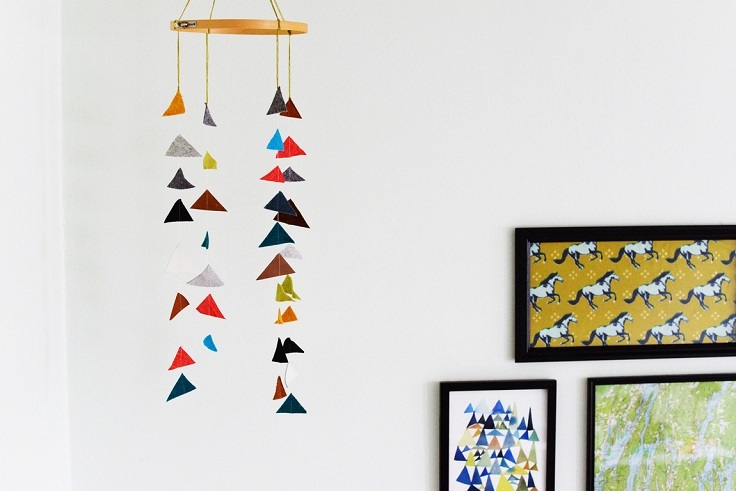 Triangles are interesting and as you can see, they fit white walls great especially if you include more colors. Plus, they are very easy to make and it’s a super quick DIY craft. You need scraps of felt, scraps of leather, scraps of heavy fabric, needle, embroidery thread, embroidery hoop, sewing machine and cutting supplies such as scissors or straight edge, cutting mat and rotary cutter. If you want to bring some warm, tropical, fruit-y atmosphere into the room, then you should definitely go after this kind of mobile. It contains fell fruit and that is easy to make, you don’t need any advanced DIY skills. Just pick your favorite summer fruit and get the needed materials and tools – felt pieces, rattan hoop, black fabric marker or Sharpie, scissors, one large, one medium and one small circular object (like cookie cutters), white spray paint, fabric glue, thread and needle and a small ring. Isn’t this mobile one of the cutest you have ever seen? We absolutely love it! 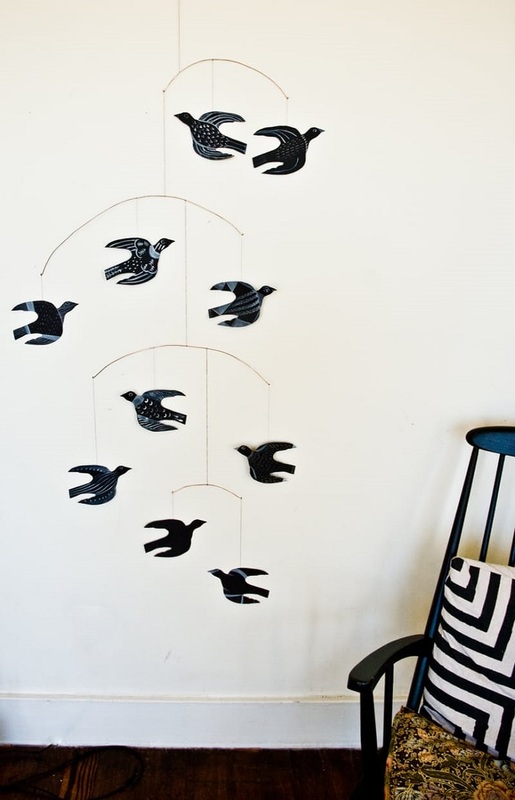 Unlike the rest on the list, this mobile uses gauge wire – copper, but it’s still an easy project! Just make sure that you have medium gauge wire like copper, thick paper (too thin and shapes curl over time) or cardboard, gouache, watercolors, or other paint of your choice. You will also need scissors and wire cutters. We’re back to the triangles, but this time they’re not made of felt, but from scrapbook paper. You can use other decorative paper as well and also make sure to have embroidery hoop (for this mobile is used 9″ in diameter), paper cutter, scissors, string, glue stick and tape. It’s really simple and it looks adorable – just look how good that floral paper is!